Microsoft is such a powerhouse in the technology industry that this corporation hardly requires an introduction. Bill Gates and Paul Allen founded the company in Albuquerque, New Mexico over 40 years ago in 1975. The duo began by building off of existing computer code, creating complementary interpreters and operation systems other companies could use to enhance their products. When Microsoft partnered with IBM (the International Business Machines Corporation, with whom Excel Consultant has also worked), their operating system became the top program for personal computers. Illness took Paul Allen from Microsoft in 1983, but Bill Gates continued to expand the empire. From Microsoft’s new Redmond, Washington campus, the company launched Windows, a graphical user interface addition to its popular operating system. In 1990, Microsoft created the acclaimed bundle of applications we now know as the Office Suite. Word, Excel, and other programs quickly became standard in personal computing—nowadays, it’s difficult to imagine using a device without them. Microsoft continued to evolve with the times, creating Internet Explorer as an application for accessing the dawning World Wide Web. The company soon entered the media market, collaborating with NBC to create MSNBC, a cable news station, and releasing its Xbox gaming console. 60% of the Excel 2013 templates that come within Microsoft Excel, we did, for Microsoft. Some project! In recent years, Microsoft has entered the cloud computing world with its Azure Services Platform and subscription versions of Office. The company has also released and rebranded its mobile devices, including the Windows Phone and Surface tablet. Microsoft’s motion sensor Kinect system has also become a mainstay of the modern gaming market. In addition, the firm launched its search engine, Bing, and provides more specialized technical services for information technology experts. Of course, as it has kept pace with these developments, Microsoft has continued to improve its foundational products—the company recently released Office 2016. As of 2015, Microsoft has annual revenue of over $93 billion and employs nearly 120,000 workers. At Excel Consultant, our team of programmers, instructors, and advisers uses the immense power and flexibility of Microsoft programs to help businesses succeed. We are delighted to partner directly with the company that makes our work possible. Microsoft’s Beth Melton lead the effort of creating templates for its Excel 2013 Uplevel project. We were thrilled to help expand the functionality and features for this important program. a. Convert survey data to Power Pivot tables (additional Excel features that allow for interpretation and graphical representation of information, including sophisticated calculations and Web-based worksheets). b. Create a Dashboard so that employees could easily access and report on survey responses. c. Reshape the flat files generated by the survey into a star schema. This spreadsheet design involves a central fact table (which includes the particular measurements, facts, or numerical bases used for analysis) surrounded by multiple dimension tables (which contain relevant descriptive information to filter or label data). The internal Microsoft team needed us to improve the Business Intelligence functions for Microsoft Defender (an anti-malware and antivirus program) using Power Pivot tables. With each of these projects, Excel Consultant’s Microsoft masters were delighted to put their comprehensive knowledge of the company’s products to use. Working alongside Microsoft professionals allowed us to test and display our ability to develop innovative solutions with Office and Windows resources. 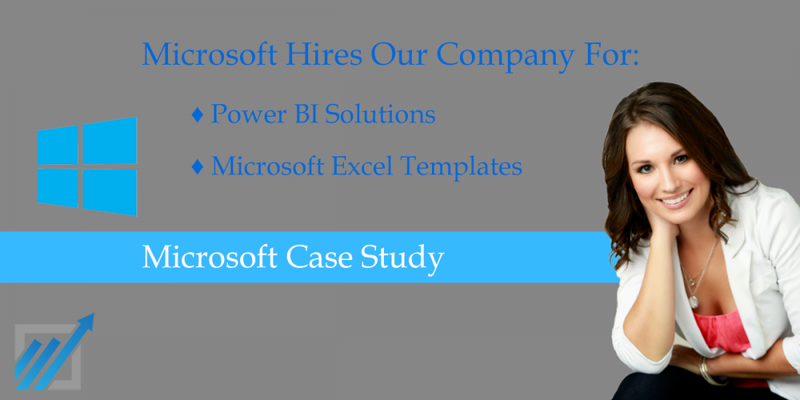 Microsoft was very pleased with the results Excel Consultant produced, as evidenced by the fact that the company chose to work with us numerous times. For our first Microsoft project, two of our Excel MVPs (Microsoft’s “Most Valued Professionals”) collaborated with company contacts to custom design Excel templates for individuals and businesses to use when they purchase the program. Our MVPs used their extensive expertise with and experience in Excel to construct attractive, functional guides. Approximately 60 percent of the Excel templates you can now open in Excel 2013 or download from the Microsoft website were based on our work (a third MVP outside of Excel Consultant developed the rest). We are delighted that Excel Consultant’s very own work can be seen inside Excel 2013, a program our clients and our team utilizes on a daily basis. If you’d like to view the fruits of our labor, you can check out the templates Microsoft proudly features on its website. Jacob Hilderbrand, our Premier developer (and Microsoft MVP for the past three years) led the assignment to create a Power Business Intelligence Tool for Microsoft. One of our associates at Microsoft commented that Christopher Fennell (our CEO, President, and Founder) and Jacob were “well positioned technically to take over and deliver on this project.” We fulfilled all of Microsoft’s high expectations. Using the workbook of design views (worksheets completed with specified content to be used as a basic indication of visual design) and a small anonymous excerpt of the wide survey data file Microsoft created, we got to work creating Power Pivot tables, an intuitive Dashboard, and the corporation’s requested star schema. Completing Microsoft’s requested designs gave employees much greater flexibility in viewing and interpreting the data without the need for additional coding or customization. In addition, our work allowed Microsoft to better use some of the specialized features its own team had designed for Excel 2013, including hierarchies (which allow users to create and view particular paths of data) and Business Intelligence Power View functions (which provide more advanced data visualization for the purposes of analysis and presentation). Microsoft employees now use the solutions we designed every day. After finishing this complicated task and helping Microsoft’s staff operate more optimally, Jacob Hilderbrand took on Excel Consultant’s third project for the company. He devised Power Business Intelligence capabilities for Microsoft’s internal team to improve, manage, and run their Defender software. Jacob used Excel 2013 Power Pivot tables to create a robust yet streamlined system for this purpose. Microsoft only works with the best consultancies for its own Excel development and Business Intelligence projects. Excel Consultant is honored to have had (and made the most of) these opportunities. If you’d like to learn more about how our company can help you succeed with Microsoft programs, contact us today to schedule a consultation.